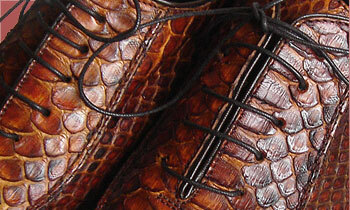 At last our genuine python men’s shoes collection is ready! I am happy to announce that we have finished preparing the display of men’s shoes in our stores. We have collaborated with some of our most skilled artisans, who have helped us create several shoe models, modern adaptations of classic designs, in genuine python leather with suede trims. Needless to say that these shoes, like the rest of our products, are 100% made in Italy by skilled Italian master leather workers, who know their profession inside out and whose families have been working leather with passion and pride for generations. Every detail is perfectly worked by hand and the leather we use, as for our handbags, comes from one of the best Italian tanneries.